The RICE method is one means of resting your sore feet. The acronym RICE stands for rest, ice, compression and elevation. An "M" is sometimes added to include medication. Rest can simply be stopping participation in basketball until your feet feel better. Ice your sore feet for 20 minutes at a time every three to four hours. Compression means applying an elastic sleeve or bandage to help reduce possible swelling. Elevation means placing your feet above your heart as much as possible, like lying down and placing them on pillows. Anti-inflammatory medications can help reduce pain. 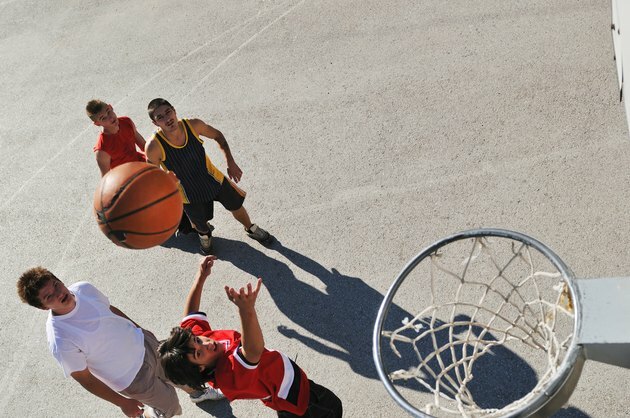 The American Academy of Podiatric Sports Medicine indicates that many of the pains and injuries felt in basketball can be prevented by proper conditioning. Always stretch and warm up prior to a basketball game. A warm-up should include five to 10 minutes of walking, using a treadmill or an elliptical machine. Stretching should take another five to 10 minutes. Pay special attention to your lower body. Participation in a weightlifting regimen for the lower body muscles can help to reduce the likelihood of chronic and repetitive injuries. Durable, high-quality shoes go a long way toward preventing sore feet in basketball. A good pair of shoes also can help to prevent ankle, leg, hip and back pain. Shoes should provide your feet with proper stability, flexibility and shock absorption. Dr Micheal Lowe, team podiatrist for the Utah Jazz, indicates that basketball players should change their shoes frequently. This can drastically reduce the occurrence of overuse injuries. Lowe indicates that most high school basketball players use one pair of shoes per season. He states that if players changed their shoes monthly, chronic and overuse injuries will greatly decrease. He also mentions that National Basketball Association players replace their shoes every two to three games. When conservative measures fail or pain persists for more than five days, visit a podiatrist, or foot doctor. A podiatrist can investigate what is causing your pain. Chronic foot pain might be the result of a biomechanical abnormality that places excessive stress on your feet. A biomechanical abnormality often can be treated with a prescription for orthotic devices, which help to distribute your body weight evenly. A podiatrist also might prescribe exercises and taping of the foot and ankle to solve your problem.